Sometimes you just see something that captures your fancy. 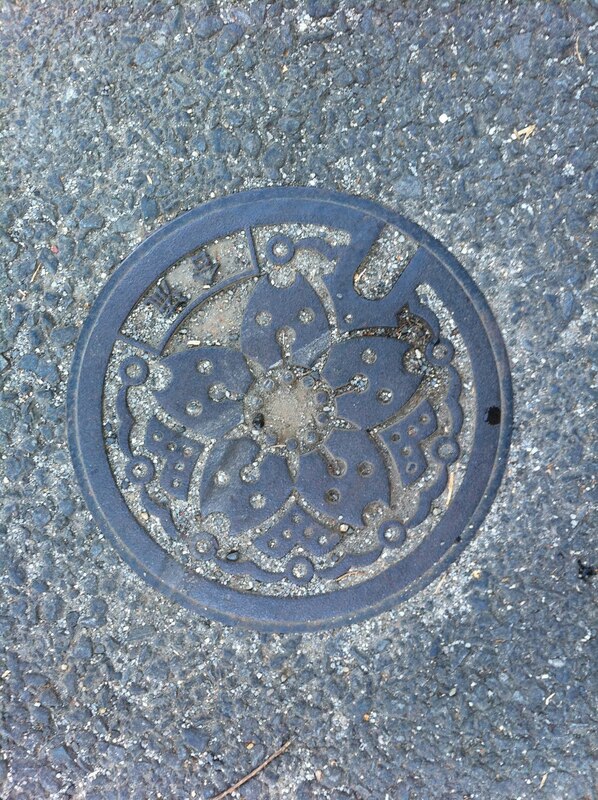 The other day while walking with Pippi, I looked down and saw this metal cover embedded in the sidewalk. 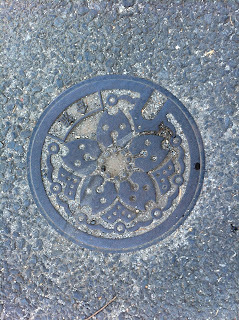 Decorated with a five-petalled cherry blossom, it caught my eye and we paused for a moment to take a close look. No more than 8 - 10 inches in diameter, it was slightly dirty but the pattern still showed through. In Japan, cherry blossoms often show up where you least expect them! Someone took the time to consider this cap's appearance and the care to think about the people who might see it. How did that someone decide on a cherry blossom? Did they consider other motifs? I wonder who that person is? I wonder where they are right now? 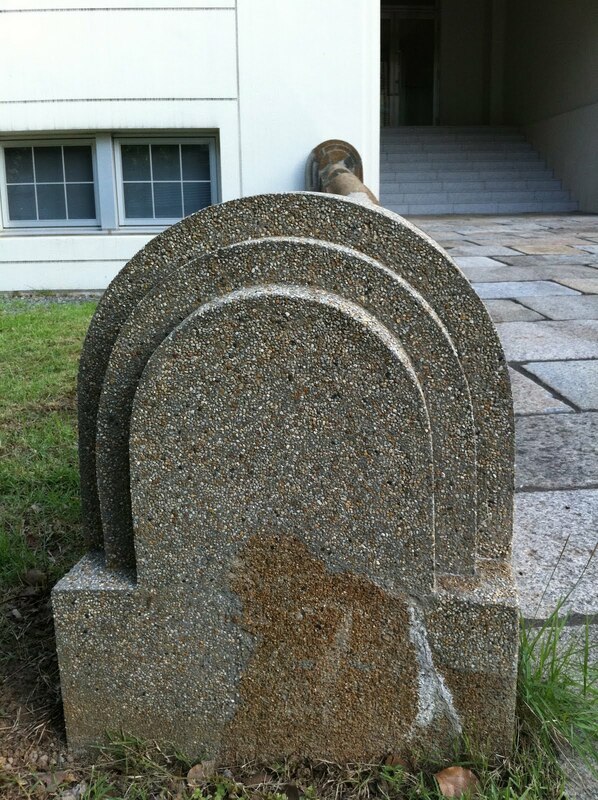 A dead ringer for a tomb stone, this marker stands at the entrance to a fragment of the old Seiken (the Japanese acronym for the Institute of Industrial Science), the building where I once went to school. 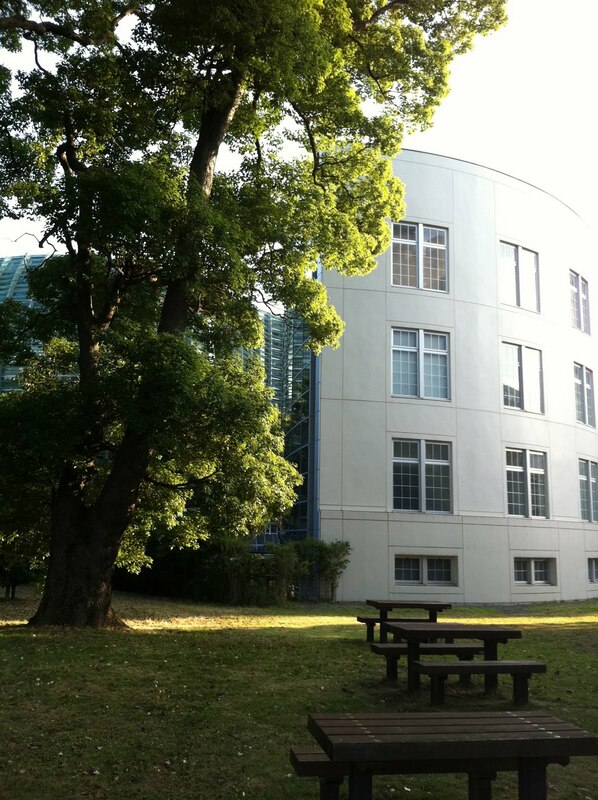 For years this oblong, donut-shaped structure with "research laboratories" lining its full perimeter belonged to Tokyo University. Dark and creepy, it was a real throw back to a bygone era. By the time I got there, parts of the building were no longer even in use (a frequent occurrence at Todai). And peering in through the windows or glazed doorways often yielded a view of outdated scientific equipment. Still, I appreciated the sense of history embedded in its concrete walls and those wide stairways evoked a sense of grandeur that once was. I do not know its exact dates, but my guess is that Seiken was built right after WW II. Much to my chagrin, the building wasn't quite torn down to make room for Kisho Kurokawa's National Art Gallery. But in some ways, I wish it had been. 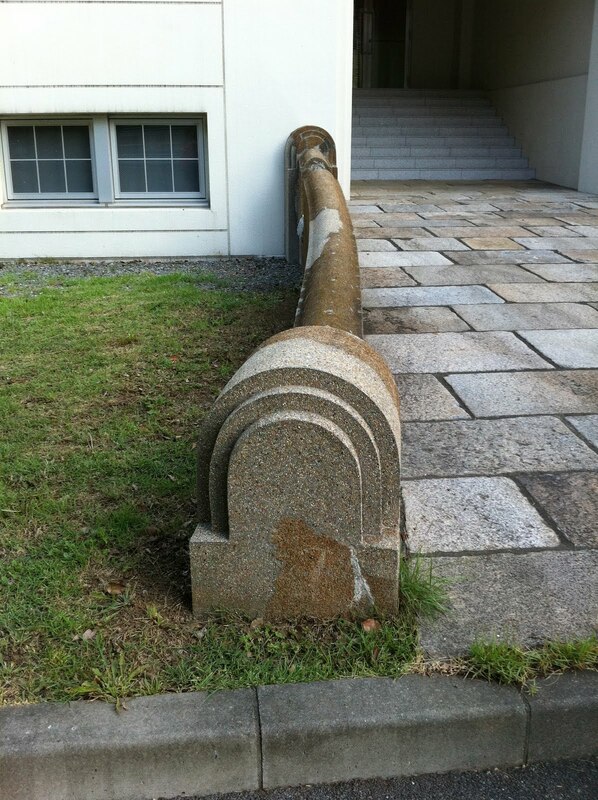 I really hate Japan's penchant for saving parts of buildings. This tendency goes way beyond the usual facadism -- many countries are guilty of literally saving (just) the face of historic buildings. For some reason, people in high places in Japan think it is better to save a fragment of a building. I realize that full-scale renovation may not have been practical due to seismic concerns and expense (I am giving them the benefit of the doubt here). But frankly, letting the building live on in our memories would have been a more dignified ending. 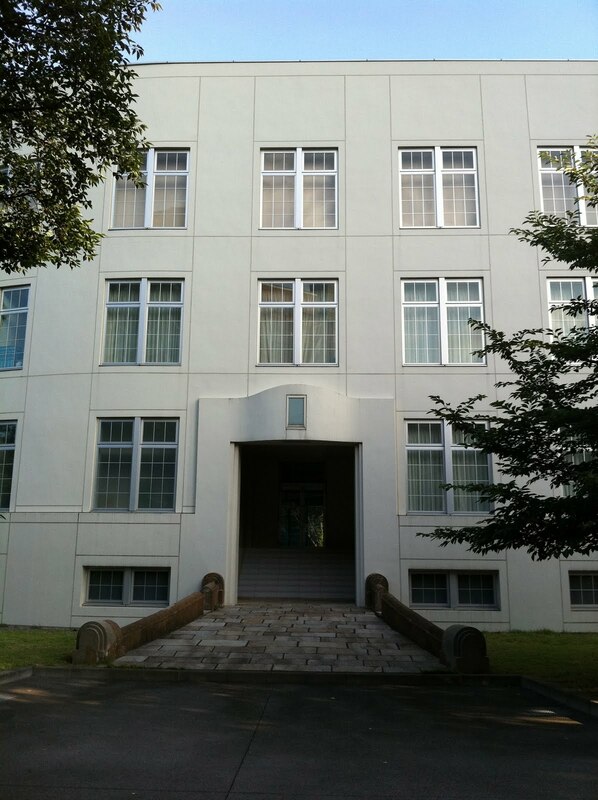 This spiffed up exterior looks ersatz and I'll bet the interior has been converted into a memorial lecture hall --it always is. R.I.P. Let Seiken rest in peace! This is about as close to eating real sashimi as I am likely to ever get. 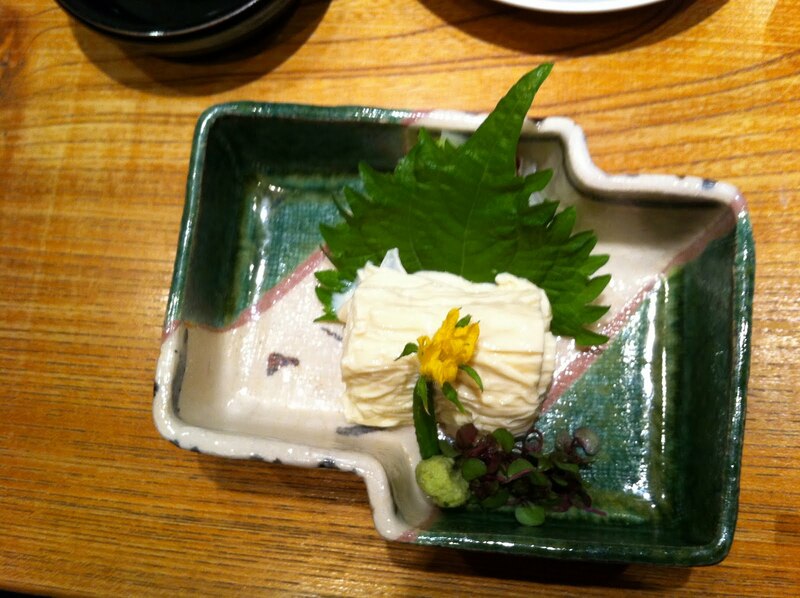 As artfully presented as a dish of raw fish, this delicious tofu skin was part of our recent dinner at Kurosawa, one of our favorite neighborhood restaurants. When the weather gets hot, Japanese food is the only way to go -- light and refreshing it sits comfortably in the stomach of even the most overheated. To the uninitiated, yuba may not sound any more appetizing than raw fish. Composed of folded, filmy tofu layers, it is one of our favorite foods. Like sashimi, it is eaten with a dash of wasabi-laced shoyu. 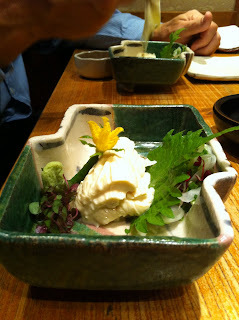 Though extremely benign, yuba's slightly slimy texture and milky complexion is a bit of a gustatory hurdle for some. Yuba sashimi is not considered faux fish but there is a certain delight in presenting and eating the two foods in the exact same manner. The accommodation of eating style or cooking method to different food stuffs is not an infrequent event in Japanese cuisine. 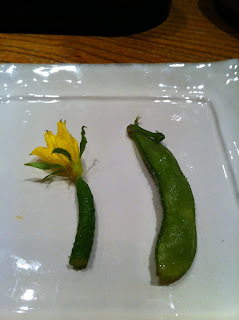 And to incorporate local and seasonal ingredients, recipes often substitute ingredients, even crossing cultural bounds. In this regard, Japanese cooking can be as flexible as many Western cuisines. Green tea tiramisu, green tea ice cream, green tea creme brulee all support this premise. But the complete replication down to the shiso leaf garnish is in a class of its own. I bet there is a word in Japanese for this kind of food play. If you know it, please share it with me in the comment box. As you can see, my yuba was garnished with a segment of the smallest cucumber we had ever seen -- no bigger than an edamame. Crunchy and sweet the mini-cuke was delicious too. While David went on to assorted grilled fish, cold, country-style, i.e. rough cut, soba noodles completed my meal.